Voyager 2 imaged less than half of the surface of Neptune's moon Triton in 1989. 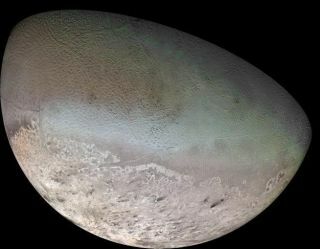 Neptune's moon Triton is one of the strangest worlds in the solar system — and that's why scientists are exploring mission concepts that could give them a detailed look at it. It's a large moon, the seventh largest in our solar system, and scientists think it was born in the Kuiper Belt before falling into its current location in orbit around the most distant planet. But that journey took its toll on Triton: Neptune's gravity pulls on it so strongly that the moon's icy surface may hide a subsurface liquid ocean. And the glimpse Voyager 2 offered of its surface suggests that Triton was geologically active as recently as 10 million years ago. "They said the magic word, Triton, and I said, where do I sign up?" Louise Procktor, a planetary geologist and director of the Lunar and Planetary Institute in Texas and a scientist working on a mission concept called Trident, told Space.com. "We know enough [about Triton] to be dangerous. We know a little bit about it, but there's so much we don't know." And of course, the best way to learn more about any object in the solar system is to visit it. Within the constraints of just a flyby mission launching in 2025 and arriving in 2038, Procktor and her colleagues believe they can photograph the moon's entire surface in a single pass. That would happen through a careful trick. On its way past Triton, the spacecraft's flight would be timed in order to see in sunlight the 60 percent or so of its surface that Voyager 2 couldn't see. After the initial approach, the spacecraft would turn its camera back to recapture the 40 percent of the surface Voyager already imaged, this time in the faint light reflected off the planet, called Neptune-shine. "People are so captivated by the idea of going to Triton, and I think one of the really big draws is the public seeing a body for the first time," Procktor said. "Just the sheer excitement of exploration is also what this mission is going to do." The feat would also mean that scientists could make real progress understanding one of the oddest worlds out there. "It's just such a weird, alien landscape," Procktor said. "It's so strange and exotic. We just think of it as this exotic, ocean world — it's a real outlier compared to the others." Triton is an outlier in a multitude of ways. It orbits the wrong way and at an unusually steep angle. Then, there's the apparently very young surface, which seems to have formed about 10 million years ago in a way scientists can't really explain to date. And much of that surface is covered in what geologists have dubbed the "cantaloupe terrain" — a phrase inspired by the melon's rough texture. Voyager 2 also spotted large plumes rising off the moon's surface and dark marks that could have been the remains of old plumes. That weirdness in part reflects Triton's complicated history in the solar system. Scientists believe that the moon was first formed in the Kuiper Belt, the ring of planetary debris orbiting in the outer solar system, before migrating to the Neptunian neighborhood. That's where it became such an active, dramatic world, on account of its interaction with Neptune's gravity. "This is definitely not yet another Kuiper Belt object; we're not doing New Horizons again," Procktor said. Instead, they'd be able to study its geology, pin down what compounds make up its surface, confirm whether a suspected ocean lurks inside and more. If Trident becomes a real mission, it also won't be doing New Horizons again in terms of cost. That mission cost NASA about $720 million; Trident is proposed to fall below the level of a $450 million, cost-capped program. "What's beautiful about this mission and the reason it fits in [that budget tier] is we're almost not doing anything fancy except the science," Procktor said. "We don't need to do anything mind boggling to get this off the ground." Not so for another mission concept being explored for Triton, which would build a spacecraft that launches in 2029 and touches down on the icy moon in the early 2040s. Then, it would hop across Triton's surface, sampling both its ice and atmosphere. A preliminary design for a robotic mission that could hop its way across the surface of Neptune's moon Triton. To be fair, the Triton Hopper concept is still firmly within the purview of NASA's Innovative Advanced Concepts program, which specializes in mind-boggling ideas. Mind-boggling like, you know, a hopper designed to traverse territory humans have never even seen. Jason Hartwig, an engineer at NASA's Glenn Research Center, and his colleagues are about a quarter of the way through a two-year grant from the program, working to design a robot that could get to Triton, then feed itself on the moon's nitrogen stores and hop across its surface, looking both up and down as it does. "Because the mission was driven to do both surface and atmosphere [sampling], that really kind of pushed us toward this hopper design," Hartwig said. Using fuel found at Triton keeps costs down and extends the mission's life. But it also complicates matters. The hopper needs to take in gaseous or solid nitrogen, convert it to a pressurized gas, then expel it like a balloon to lift itself into a hop. But planning for solid nitrogen in particular is challenging for the team to design from afar. "Snow is a solid as much as ice is," Hartwig said. "Something like snow, piece of cake: We can just scoop it up in the tank. Something like solid ice — how is the system going to behave?" Although the two Triton mission concepts are independent of each other, there's a chance they may not remain that way, thanks to the vagaries of scientific conferences. When three posters from the two mission concepts were arranged next to each other at last week's Lunar and Planetary Science Conference in Texas, the would-be Triton explorers got to chatting with each other. Coincidentally, the hopper design is currently just heavy enough to fit on board the current Trident design, Hartwig said. The pairing would pose as many challenges as it addresses, and adding the hopper would certainly push the price tag dramatically higher. But, still. "I love that they're thinking big," Procktor said of the hopper idea, "because one day we will be hopping around on the surface of Triton."